Great Eastern Railway Wagons. Part 5 – 15ft 7-Plank Opens to Diagram 48. This is the final part of the mini-series introducing the Great Eastern general merchandise open wagons that will appear on Basilica Fields. By 1903 the need for increased wagon capacity lead to Temple Mills Wagon Works building an experimental 7-plank open converted from a diagram 17 5-plank open no.23246 of the 1898 batch. New end stanchions, corner plates and side knees with diagonal bracing extending to the top of the wagon were fitted which supported the two extra planks and side-hung top doors giving an internal body depth of 4ft 0½ ins. The E-type grease axleboxes fitted to the diagram 17 were replaced with split oil axleboxes, and the new wagon rated at 12 Tons. The two-per-side door stops fitted to the 1898 batch of wagons were removed and replaced with Monarch door balancing apparatus, and the wagon retained two brake blocks fitted to one side only. The wagon was finished in the new large and revised 24″ x 20″ letter livery and was given the new rectangular combined makers/load plate. The new wagon found favour, and a total of 1350 (P. Tatlow gives 1300 in his book) were built to a slightly revised design between 1903 and 1908 with diagonal bracing to the fifth plank only and a lower load rating of 10T. In addition, 650 7-plank Loco Coal wagons to diagram 31 were converted to diagram 48 between 1904 and 1911 as numbers of the new 20T steel Loco Coal wagons increased, and although no written orders have been found, further diagram 17 5-plank opens were also converted, though when and how many is as yet unknown. 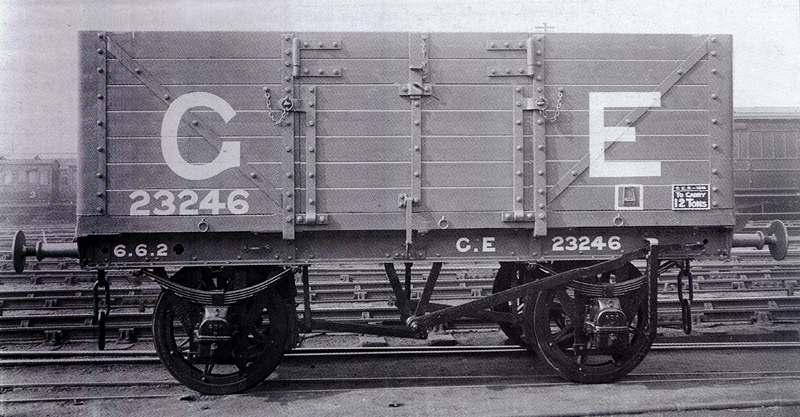 These latter wagons had new end stanchions and side knees, but retained the five-plank high corner plates and had an separate extension for the top two planks. Example running numbers include 4391 and 5021 from the 1905 and 1908 batches respectively, and 3304 was a converted diagram 17. Furness Railway Wagon Co. have a GE 7-plank wagon in their range which, I believe, covers the new-builds as well as the D.31 and D.17 conversions. Judging by the quality I’ve seen with other products from the range there may be some work needed to bring them up to the spec of other wagons for Basilica Fields. As stated at the beginning, this entry wraps up the Great Eastern Railway’s general merchandise opens built in the timeframe set for Basilica Fields. Some opens will be needed for Angel Yard in The Rookery for mundane tasks such as ash disposal. Next we’ll be taking a look at the other wagons necessary for the yard, and a new mini-series will deal with the Loco Coal and Loco Sand wagons. I am sorry to read you have been disappointed with kits from Furness Railway Wagon Company. Please could you tell me what you believe to be substandard with our wagon kit range, and in particular this wagon? All of our kits are manufactured in small batches, by hand, and in limited numbers. We have sold the majority of GER 7plk, GER 5plks and GER 3plk runs from this range, not to say a vast number of box, cattle and gunpowder vans, receiving only positive feedback. The majority of our clients return with requests for more prototypes, therefore to read your review on this website comes as somewhat as a puzzle. Thanks for your comments, but I think you’ve read more into my words than is in fact the case. I appreciate your concern, and I think it would be fair to say that you and I have had a number of discussions about the Great Eastern wagons you produce which resulted in my providing you with drawings and information to increase the level of their accuracy. Once such discussion resulted in the complete redesign of the GER wagon underframes – an undertaking which is to be applauded – and I wish other manufacturers were as open to suggestions regarding improvements and then acting upon them as you are. I’m not surprised your wagons are popular, as they do represent good value for money for many modellers, but for this very long-term ScaleSeven project I need to ensure that what I build now and in the near future will be at a level of prototypical accuracy which will satisfy me for the next few decades. * Replace the etched coupling hooks with ones cast from brass. * Replace the buffers – for the pre-1910 period the buffer housings should be the long, plain style, not the short or ribbed ones which came later. * Replace the grease axle boxes as they are not of the GE type. * Add the prominent central brake rod hanger missing which sits about 1/3 of the way inboard on those wagons with single-sided brakes. That sums up the extent of my comment in the article, and none of these alterations are unique to the Furness Railway Wagon Co. kits. I make similar alterations to almost every wagon kit I build for this project from the Slater’s plastic kits to the wide range of brass and kits from a multitude of sources. That’s not me being hair-shirt, it’s just my desire to do it right. Of course we all compromise to some degree, but in these areas I like to be as accurate as possible. I hope that alleviates any misunderstanding.